As I was getting ready to make a dressing I remembered my stash of goodies. My mom went to visit my brother in Seattle back in March for his birthday and brought me back food. What else would I want?! I have a sampler of infused olive oils and balsamic vinegars, plus something else that will remain a surprise until I am inspired. 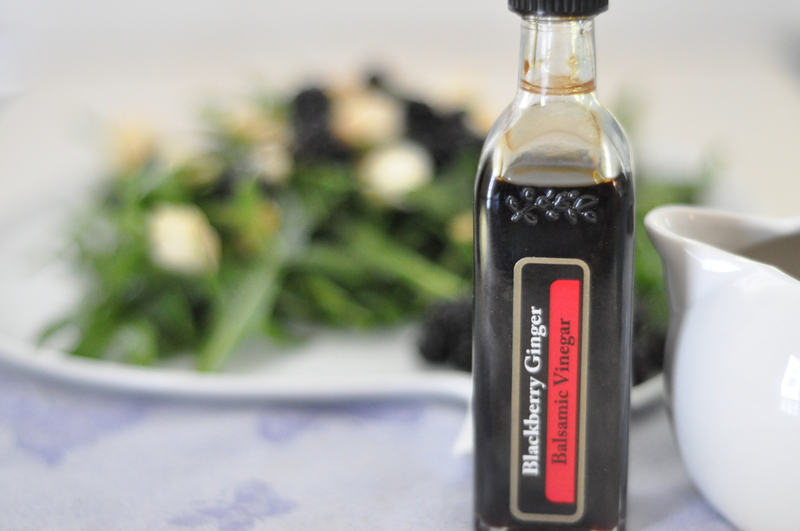 Anyway, one of the balsamic vinegars is blackberry ginger flavored. Perfect for my salad! You could easily use regular basmaic vinegar in its place. I also had a mango pineapple chèvre which was wonderful in the salad, but regular or honey chevre would also be wonderful. This is a pretty easy “recipe”. Make enough for one salad or four. Whatever your needs and likes are. I myself put lots of blackberries on mine. Perhaps I was a selfish mom, I didn’t share any of the blackberries with the kids! Don’t worry, I will make it up to them. I’m taking them foraging this weekend to some bushes I have scoped out, lots of berries ready for the picking! Place the dressing ingredients in a jar and shake vigorously. 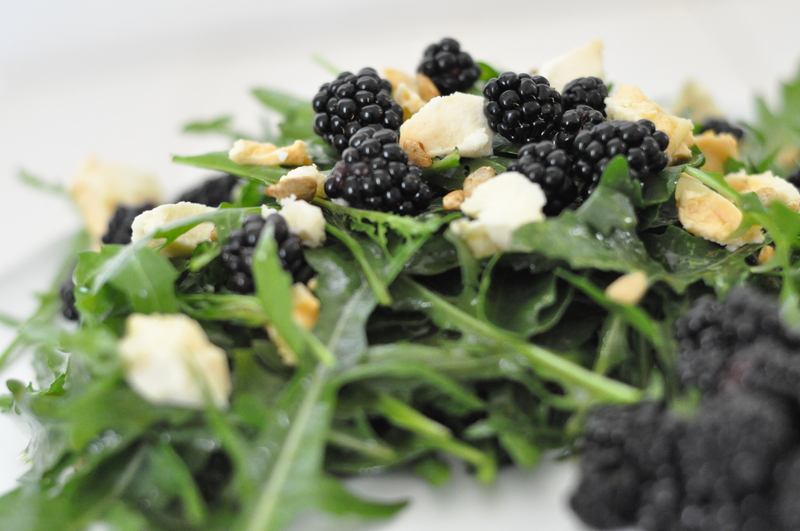 Toss the arugula with as much or little dressing as needed. 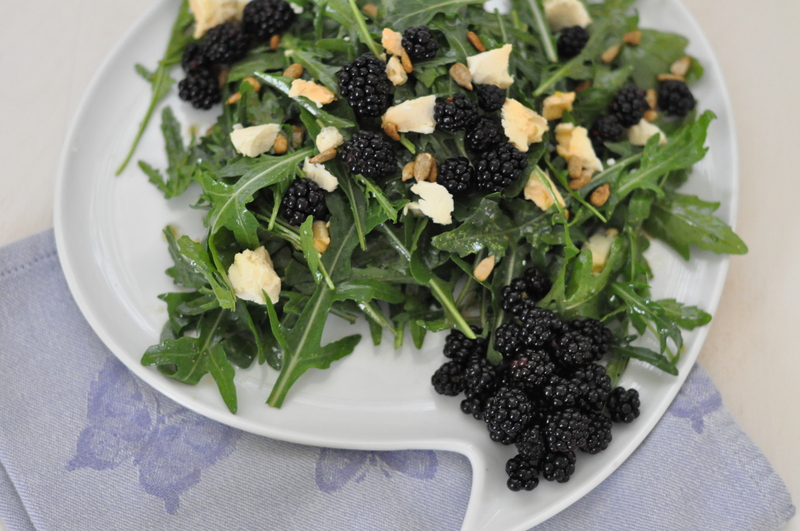 Place the dressed arugula on plate(s), top with blackberries, chevre and seeds/nuts. Enjoy! I can’t remember the brand of the cheese anymore. I want to say it was from Missouri for some reason. I just finished it today and will hunt down some more when I am in the mountains next week. We also love the blueberry vanilla chèvre from TJ’s. It makes a fabulous crepe! That sale sound great, fig vinaigrette…yum! Nowhere did you find that? 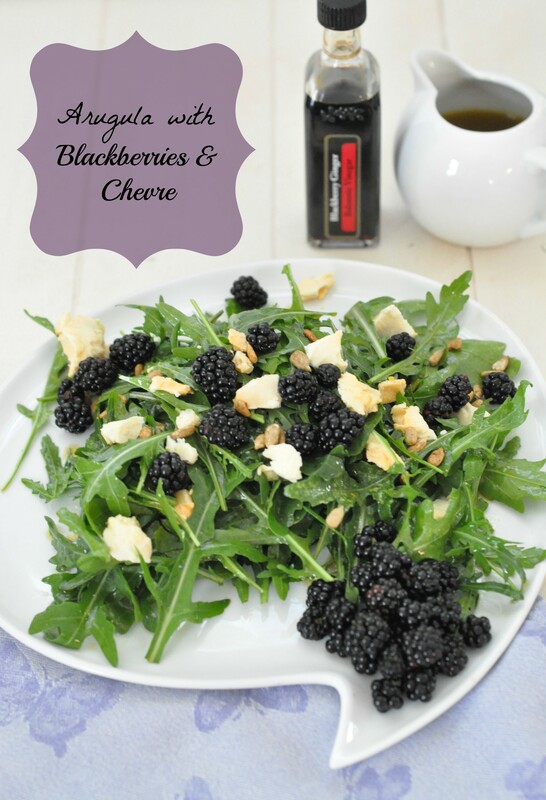 The blackberry infused balsamic vinegar sounds delicious, and the addition of mango pineapple flavoured chèvre sounds equally delicious. This is the sort of dessert I would really enjoy eating. Thanks so much for sharing and giving me ideas for my next salad! It really was wonderful! I found the cheese in the mountains and am now out. Lucky for me the boys and I head up there Sunday evening! It truly was delicious. Enjoy your weekend. I must try something similar this week. Have a lovely week!!! It’s hard to find stuff like that around here so when mom goes to visit my brother she always knows what to bring back! Such a pretty salad! Love the colors. I am already missing the fresh blackberries! Yum. This looks so tasty. Blackberries remind me of childhood and selling them to the local jam factory. Sounds like fun! We just picked blackberries in a camping trip and loved every bite.